NEVERLAND TRANSIT AUTHORITY: Seasons Greetings from The Conductor! 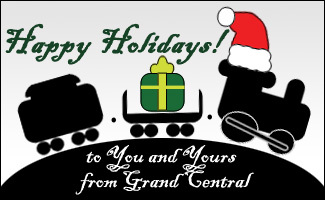 Seasons Greetings from The Conductor! No matter your personal, cultral, bend at this time of year, we, here at Neverland Transit Authority, would like to extends our heart felt wishes for a good holiday, and a spectacular new year! Here's to 2012! And, hopefully, much, much better things down the tracks!